IF YOU ARE SUFFERING FROM DEPRESSION, NOT FEELING RIGHT, OR JUST NEED SOMEONE TO TALK TO, THE FOLLOWING OLD BREED MEMBERS ARE AVAILABLE 24/7/365. CALL ANY OF US ANYTIME. You can also call the Veterans Crisis Line at 800.273.8255 and Press 1. Or text 838255. Your call to any of us is confidential. We love you, need you, and want you with us until Valhalla. Seventeen years ago the Marine Corps West Coast Rugby Mafia, a.k.a. the Ghostrider alumni and select friends from Lejeune other Marine teams got together and played in our first Old Boys match. It was May 2002 and the “Marine Corps Legends” (pre Old Breed days) descended on Las Vegas in no particular order to play rugby, rekindle old friendships, and party like Rock stars’. It was the first Old Boys’ event any of us had played in and we not only won but dominated the over 35 division. We finished 4-0, winning a 12-team bracket, and thankfully no one was arrested or had to speak to their CO’s or Sgt.Maj. 's the following Monday. Even though we didn’t get together during the next few years, it laid the groundwork for what was to come, what was to be born out of tribulation, and what we became, and what just brought us to hosting our own event last weekend the Honor Cup. Two short years later the Old Breed was born out of tragedy and we haven’t looked back since. The Old Breed was formed for the purpose and intent to Honor Kevin Shea and to ensure that his sacrifice wouldn’t be forgotten and his legacy would be passed down from one generation of Marine rugby player to the next. For those of you who did not know him while alive and have only heard the stories about him, Kevin is not a myth made up by us old timers. That being sais he was indeed legendary even while alive. 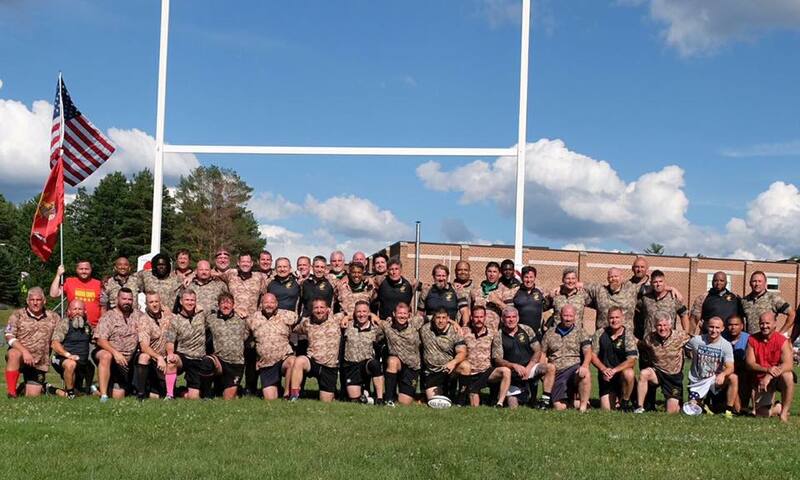 This past weekend our club had the honor and pleasure of hosting Ami Shea who will also be in attendance at Saranac and our clubs Guest of Honor during of Friday night ceremony at the American Legion in Lake Placid as well as Brigadier General Sparky Renforth & Lieutenant General Toolan both legendary Marine rugby players in there own right. As great and dominant as Kevin was on the pitch his playing ability paled in comparison to the type of friend he was, the Marine Leader he was, and the father and husband he was. He was everything we all should emulate and strive to be. He was killed on his 38th birthday a few short days before he was going to be coming home from Iraq, and returning to his family and taking command of 9th Comm. So after that fateful day the “Marine Corps Legends” came out of retirement, changed our name to the Old Breed, got back together in Vegas, and began our Mission of Remembrance. Soon thereafter Captain John Maloney, another former Ghostrider who played at Camp Pendleton while an enlisted Marine and who was later commissioned joined Kevin in “Guarding Heaven's Gate” and as fate would have it is interned one row behind, a few grave sites over from Kevin which can be seen as divine intervention being that they played some many matches together at Flanker & Eight-man. John was a Marines, Marine and an incredible leader and was so well respected he received the Leftwich Trophy for Leadership posthumously. Over the years the Old Breed has expanded to where we now have more than 850 members, we participate in numerous events, have won our share of tournaments, are known and respected both in and out of rugby circles, and are recognized by USA Rugby. Unfortunately all along the way the number of fallen ruggers has also grown. Regardless of how much we have expanded our mission is still the same, and that is to honor, remember, and commemorate our fallen. Our shared bond may be rugby, our gatherings’ rugby events, and our battlefield the pitch but we are much more than a rugby club for we are the keepers of the flame. The flame that burns in all our hearts, the flame that drives us to do what we do, and the flame to keep the memory, legacy, and the sacrifice our Honored made for our Nation and our fellow Americans always alive! I look back on the Old Breeds humble beginnings and see where we are now it amazing. Last weekend for the first time we hosted our own tournament, The Honor Cup. It was an incredible event and I can’t tell you how appreciative and lucky our club is to have club members and supporters with the vision, dedication, drive & determination to pull it off. You all know who you are and you all are owed a debt a gratitutude from the rest of us. Sitting here typing this in the glow of its success (and now finally dry after three days) I am proud to have attended the first of waht I hope will be an annual event. I am proud to have been a part of our club from the beginning, to be a part of it now, and to be a part of it as long as I can. To see what has grown out of Kevin sacrifice, to be part of what was started in his name, and to witness how far the battle cry to honor him has brought our club is truly remarkable and humbling. The Old Breed’s ultimate mission is to Honor, Remember, and Commemorate our list of Fallen, but we have also become a pillar of strength and a source of support for our members & brothers in emotional and physical need, and have helped fund college scholarships for the children of those no longer with us in general and for the son of one of The Old Breeds “Honored” in particular. I am proud to have taken the pitch with Kevin & John and many of the others on our list of Honored. I am proud to take the pitch with you now. I am proud, and I know you all are to wear the Old Breeds colors, our EGA, and our Black Mourning Band. I am proud of the friendships and bonds I have forged through Marine Corps & Old Breed rugby and I am hopeful that the next generation of rugby players will be as blessed as I have been because of them and that the Old Breed will be part of their rugby experiences, memories, and lives. More than a rugby club, The Old Breed is a family of Marines that honor the memories of our Marine rugby players we have lost since September 11, 2001. In addition to honoring the memories of our Fallen Marines, we provide a brotherhood for Marines and others affected by a generation of war fighting. We lend an ear to listen, a shoulder to cry on, a purpose for serving. Over the years, our ranks have grown to include members of other US armed services, international military members, and select civilians. All share a common bond of service, sacrifice, tenacity and espirit de Corps. You don't need to be a Marine to join our ranks, but you must uphold the values, standards and reputation for which the Marine Corps is known and contribute to the accomplishment of our mission. Honor. Courage. Commitment. These are virtues by which the Marine Corps lives. As a club of active, veteran and retired Marines, we share these virtues and seek to represent them with our club. Please support our club and our mission.